The Concordia Stingers have earned themselves a break. After a blowout win over the Nipissing Lakers, the Stingers finish the first part of their season with a four game win streak, winning five of their last six games. That stretch started with a hard fought shootout win against cross town rival McGill and wrapped up with the biggest offensive showing of the team this season. The Stingers looked like last year’s team against Nipissing: pesky, hard hitting, fast paced, and deadly when given any space. They no longer have league MVP Anthony Beauregard or all-star Massimo Carozza, but they’re finding players just as willing to put in the offensive work to make up for that. Five Stingers found themselves with three or more points against Nipissing, two of which put up more goals on their own than the Lakers managed as a team. Charles-Éric Légaré embracing his newfound offensive role this season, buried his first U sports hat trick and added two assists along the way. The winger now sits at 14 points in 15 games. 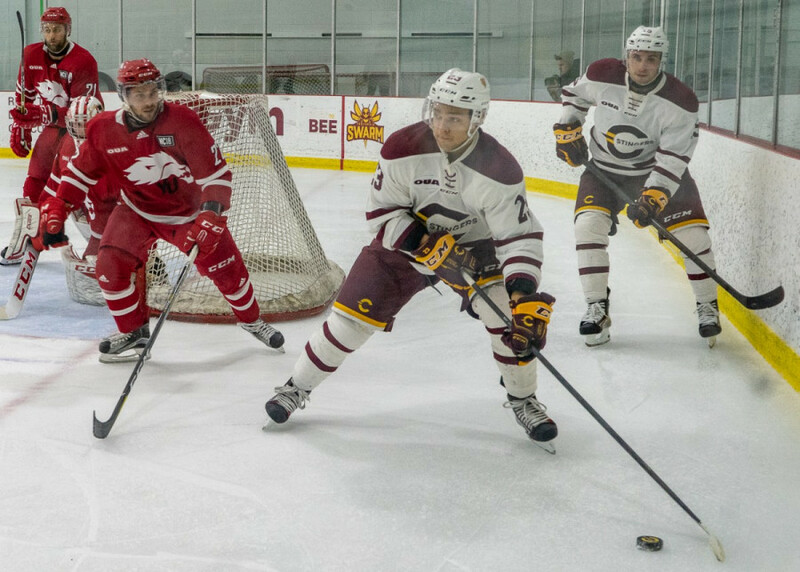 Along with Légaré, rookie first line centre Hugo Roy scored four goals, bringing his season total to 14 in 16 games, tied for second in the nation. Last year, Beauregard scored 19 in 28 games and ranked second in the country. “It’s a hard league to adjust to coming out of the [Canadian Hockey League] but [Roy] did an amazing job. He works really hard and deserves all the credit,” said Stingers head coach Marc-André Élement. Roy has established himself as a top tier scoring threat in his first year. He’s quickly gelled with his equally productive wingers Philippe Sanche (16 points in 15 games) and Philippe Hudon (14 points in 16 games). Performances like these can be major boosts to a player according to Stingers players. Not only do they pad out the stat sheet, but they can play a big role in a player’s mental state moving forward. “It feels good. I’m gonna start January with a lot of confidence forsure. I want to start the second half of the season the right way,” said Légaré. It seems that his team is in the same place. They’ve started to click heading into the next half of the season and have found a new level of confidence and strength in their play. The Stingers not only produced more than they have all season, but looked looser and more in control of their play. Their powerplay was clicking when it had failed to do so earlier in the year, passes connected smoothly, and offensive opportunities were not passed up, but capitalized on. With the second half of the season starting in January and a month to heal up, the Stingers may have found the right time to heat up. “I think it’s the perfect time. It’s a real confidence booster winning four in a row. It’s good to go into that long stretch of no games with a positive mindset,” said Stingers defenceman Carl Neill. His coach couldn’t agree more and is certainly happy to end the semester on such a strong note. “It’s really important. Guys know that we’re gonna have help after [the break],” said Élement. That help comes in the form of top tier defensive recruit Simon Bourque, NCAA division one recruits Dylan McCrory and Colin Grannary, last season’s provincial triple A leading scorer and MVP Brendan Hamelin, and at least one more major junior recruit. All will play their first game in the new year due to a blend of injuries, paperwork, and recent recruiting by the program. If the momentum continues to swing for the Stingers, the team is certainly in a strong position heading into the winter semester.